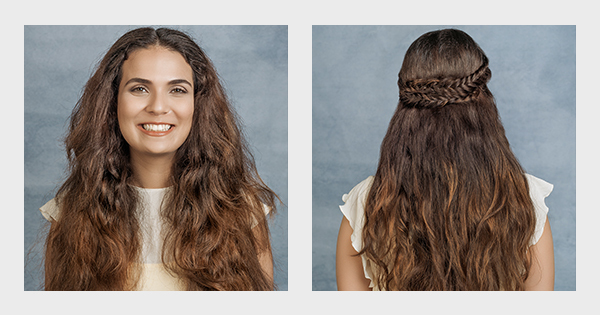 A perfect look for your long, wavy locks, this braided hairstyle is an easy DIY for any and every occasion. All you will need is five more minutes in the morning, your gorgeous wavy hair and your trusty fingers for braiding. Step 1. Pick up a thick piece of hair from above the left ear. Step 2. Divide it into two parts, Section A and B. Step 3. Pinch a thin piece of hair from the far end of Section A, cross it over to the middle of Section A and Section B. Step 4. Next pinch a thin piece of hair from far end of Section B cross it over to the middle of both sections again. Step 5. Repeat this action tightly to finish the braid, and secure it with a hair elastic. Step 6. Make a similar braid by repeating the process on the other section of hair above your right ear. Step 7. Pick up the first braid and taking it across the back of your head, pin it on the opposite side, at the back of the right ear. Step 8. Pick up the second braid and pin it on the opposite side, at the back of the right ear. That’s all you need to pull off an Indo-Greek look!